Home» Daily Sprout » A great read from Mercola on Junk Food! A great read from Mercola on Junk Food! I believe many of our country’s chronic health problems would simply disappear if greater attention was paid to the root problem — the food you eat. Americans’ reliance on processed foods is a major factor that drives the rampant disease increases in the US, such as diabetes. According to a new report from the American Diabetes Association,1 an estimated 22.3 million people were living with type 1 or type 2 diabetes in 2012, up from 17.5 million in 2007. But why do Americans buy so much processed food and junky snacks? Well, first of all, junk foods are heavily promoted by the US government via agricultural subsidies for crops like corn and soy. Add to that misleading yet highly effective marketing, and — the focus of this article — the addictive nature of junk food, which is a science in and of itself. In order to protect your health, I advise spending 90 percent of your food budget on whole foods, and only 10 percent on processed foods. Most Americans currently do the opposite, and this will undoubtedly have an effect on your health, especially in the long term. In the featured New York Times article,2 investigative reporter Michael Moss writes about the extraordinary science behind taste and junk food addiction, and how multinational food companies struggle to maintain their “stomach shares” in the face of mounting evidence that their foods are driving the health crisis. 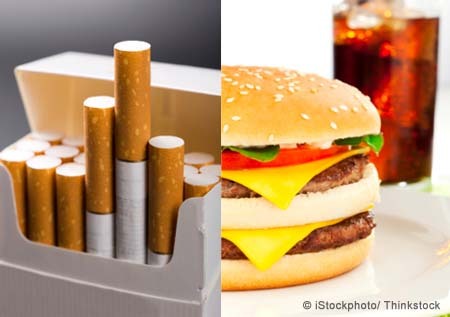 On that day in 1999, Michael Mudd, vice president of Kraft, did “the unthinkable” during his speech — he drew a connection between processed foods and cigarettes. We no longer condone cigarette ads for teens, having clearly established the health hazards associated with smoking, despite decades-long denials from the industry. Yet we now blindly accept the same kind of misleading tactics being applied to junk food, even though the health ramificationsrival, if not surpass, those of smoking. Mudd presented a plan to address the obesity problem, which would help defuse the criticism building against the food industry. In my view, the criticism was, and still is, justifiable. As just one example, General Mills created Yoplait that same year (1999), which “transformed traditional unsweetened breakfast yogurt into a veritable dessert,” to use Moss’ own words. In fact, Yoplait yoghurt contained 100 percent more sugar per serving than the company’s Lucky Charms cereal! Yet everyone recognized yoghurt as a wholesome food, and sales of Yoplait soared. Mudd proposed employing scientists “to gain a deeper understanding of what was driving Americans to overeat.” Once they knew that, products could then be reformulated; salt, sugar and fat use could be reined in, and advertising could be repositioned. The 1999 meeting didn’t go well. It effectively ended when Stephen Sanger, head of General Mills, allegedly stated he would not jeopardize the sanctity of the recipes that had made his products so successful in order to appease the critics. Fast-forward a decade and we now have novel biotech flavor companies like Senomyx, which specializes in helping companies do what Mudd proposed — finding new flavors to reduce sugar and salt content in processed foods. These “flavor enhancers” are created using secret, patented processes, and they do not need to be listed on the food label. The lack of labeling requirements is particularly troublesome and will most likely become an issue in the future. As of now, they simply fall under the generic category of artificial and/or natural flavors. What this means is that the product will appear to be much “healthier” than it might otherwise be, were a flavor enhancer not used. The question is, are chemical flavor enhancers safe? Or are food companies simply exchanging one harmful substance for another? That remains to be seen.